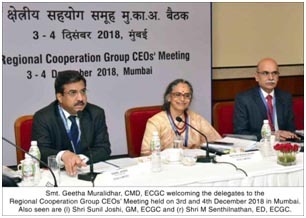 Mumbai, 4th December, 2018: The 10th annual meeting of CEOs of Export Credit Agencies (ECAs) of the Asia-Pacific Regional Cooperation Group (RCG) was held in Mumbai during December 3-4, 2018. The meeting was hosted and chaired by ECGC and attended by delegates from eight ECAs, namely, EFIC, HKECIC, KSURE, NEXI, SINOSURE, TEBC, Thai Exim and ECGC. The member ECAs are the official export agencies of the respective countries/regions that extend support to cross border exports in the form of credit insurance, guarantees or loans. RCG members contribute to over one-third of the total export credit and insurance business reported by the Berne Union (the larger group of the credit and investment insurers). The members noted that the Asia Pacific region has been contributing to the growth of the global economy post 2008 financial crisis. The members strive to enhance co-operation and joint engagements to boost exports between Asia Pacific nations and with the world. 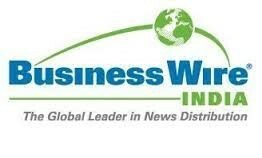 The Group discussed risk management practices and information exchange pertaining to export credit insurance. Recognizing the role of SMEs in the economic development, the members discussed the new initiatives introduced for informing and educating its export oriented SMEs. The other issues discussed included, impact of sanctions on underwriting policy and exposure, and members’ approach towards delayed export realizations. The RCG also discussed expansion of membership with a view to strengthening its partnership within the region. Updates on the International Working Group on export credits and on the Indian economy were well received by the delegates. The members reaffirmed their commitment to mutual cooperation and support to give a fillip to trade and investment.